The 17 expanded food stores offer all of the merchandise found in our general merchandise stores with the added convenience of fresh food. This new format has an open-market layout and features new food additions including basic fresh produce, fresh meat and bakery goods. Each expanded food format store employs 100-250 team members and is approximately 135,000 square feet. According to this SeacoastOnline article, the Greenland store has 123,688 square feet of space and employs 165 people. Also, the store has a Starbucks, Target Cafe, and a pharmacy. The word on the street is that Lowe's (shown above) is targeting an early December opening (UPDATE: according to SeacoastOnline, it's now scheduled for Jan 8, 2010). The shell of the building is coming along and it won't be long before the roof is ready to go on. Pictured above, just behind the red Target ball, is the gravel space where the new Stop & Shop store will go. Apparently, they've signed a lease on the land and are paying rent, but as of yesterday, they haven't broken ground on the new store. I'm not sure why construction is delayed, but I'll dig a little to see what I can learn and provide an update later. The Denver News recently reported that Xcel energy is seeking PUC approval for a new monthly fee for customers connecting their solar panels to the electric grid. According to a report by Clean Skies News, the monthly fee proposed by Xcel would be 2.6 cents per kilowatt-hour and is in addition to a $7-8 monthly meter reading charge that all customers currently pay. Last week, Amazon got a big dollop of egg on their face for helping themselves to Kindle owners' virtual bookshelves and performing a mass purge of legally purchased copies of George Orwell's 1984 and Animal Farm from Kindle digital book readers around the globe. Seriously, I'm not making this up. Apparently, there was an issue with Amazon's legal right to sell the book. In response, they yanked the book from their online bookstore. No big news there, but what happened next drew fire from conspiracy theorists and DRM opponents around the globe. Apparently, the Kindle has had a "feature" all along that allows Amazon to remotely delete items from users' virtual bookshelves. Purchasers of digital books don't actually own the books they purchase for their Kindle, they only own a license to read the book. Under the terms of that license, Amazon may revoke the license under certain circumstances (although their right to do that is disputed). Anyhow, until last week, Amazon had never made use of this take-backsies feature. You can't help but enjoy the irony in the fact that the first title they chose to purge was George Orwell's 1984. Also, this mishap once again demonstrates that purchasing the right to use digital content is not the same as purchasing a physical embodiment of that content. For his part, Jeff Bezos fell pretty hard on his sword in his response to the incident over at the Kindle Community on Amazon. Tech Crunch - Amazon, why don't you come in our houses and burn our books too? Did the investment choices of a pension fund manager in California affect the welfare of dairy farmers in Stratham, NH? Taylor said one aspect of the price setting formula needs to change immediately because it's connected to commodity prices set by the Chicago Mercantile Exchange — which has become a proven ground for ever more-complicated derivative investment schemes designed to turn quick profits, not unlike the same ones that produced mortgage-backed securities and credit default swaps. "It's fairly obvious there's speculation, we know there's speculation," Taylor said. And there's little the local dairy farmer can do to stop it. Financial speculators running wild in the milk market? What's up with that? It turns out that under the US government's Byzantine agricultural price support program, the price paid to dairy farmers for their milk is indirectly connected to prices set on the Chicago Mercantile Exchange for butter and cheddar cheese. So when the spot price of butter or cheese increases on the Chicago Mercantile Exchange, The Stuart Farm in Stratham is likely to get a better price for their milk. Likewise, if commodity prices collapse, it can really hurt local dairy farmers. You may recall that last year some politicians were blaming high gas prices on commodities speculators. The concern was that people with no interest in an underlying commodity were making big bets on future prices and by doing so, were impacting the prices of the underlying commodity. Most of the fuss was about oil speculators, but the same forces were at work in other commodities. Now back to milk prices. 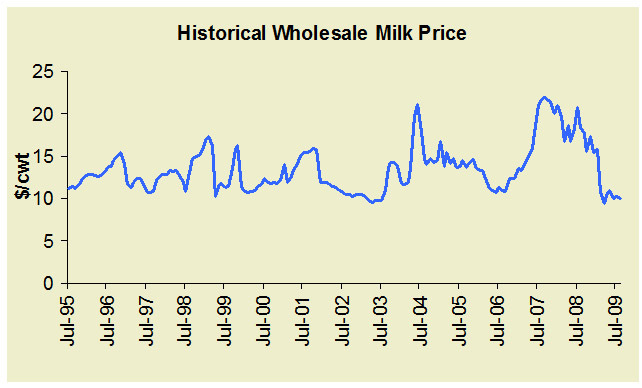 The graph below shows the wholesale price of milk since 1995. The price is quoted in something called dollars per hundredweight ($/cwt). You can see that the price is quite volatile. In just the last year the price has ranged from under $10 to well over $20. It'd sure be tough to run any kind of business when the market price for your output is bouncing around like that. 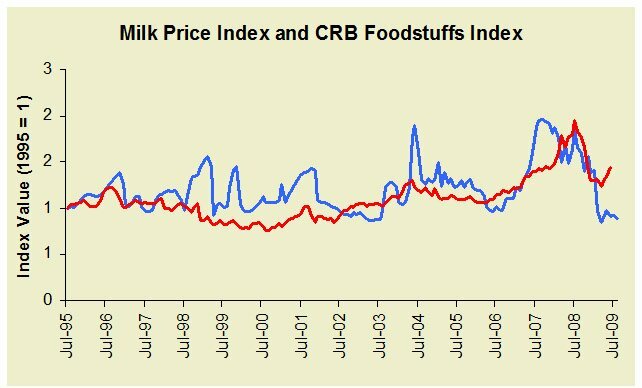 Next, to see how the fortunes of dairy farmers appear tied to those of commodities traders, take a look at the graph below of the price of milk vs the CRB foodstuffs index. This well known commodity index does have butter in it, but it also has 9 other commodities including corn, sugar, hogs, soybean oil and wheat. Aside from a general uptrend from inflation, there's no clear reason why the price of milk would be correlated to this broad agricultural index. But as you can see from the graph above, the two lines may not trace identical paths, but they definitely rhyme. It sure seems like the prices of unrelated commodities may be impacting the price paid to NH dairy farmers for their milk. At the least, something is causing milk and a diverse basket of agricultural commodities to be very highly correlated. Maybe you're skeptical, since the CRB foodstuffs index is comprised of only agricultural products? 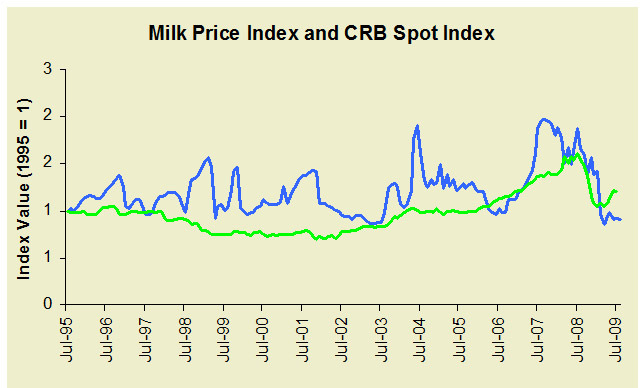 The graph below shows the price of milk vs the CRB commodity spot index. This index includes everything in the foodstuffs index plus metals, textiles, industrial materials, and livestock. Since it contains a broad mix of unrelated commodities, it isn't nearly as volatile as the price of milk. Still, there does seem to be a connection. The plot of most commodity indices looks roughly similar to the green line in the graph above. That line clearly shows that between 2005 and 2008, the world was in the grips of a nasty commodities bubble that impacted the prices of nearly all commodities, including milk. For us here in NH, the most immediate impact of this bubble was a sharp spike in the price of gasoline, home heating oil, groceries, and other essentials, followed by an abrupt crash late last year. Ok, so how does all this explain a how a pension fund in California could impact the price of milk in Stratham, you might ask? Well, the "speculators" that got the blame for high gas prices, and even the high milk prices, were often portfolio managers for pension funds, college endowments and other investment firms. The charge was that all this new money entering the commodities market inflated prices, and when the market fell last year, these same speculators rushed for the exits and caused commodity prices to plummet. Although there were certainly speculators, the big money flowing into commodities between 2005-2008 wasn't speculating as much as hedging. Large institutional portfolio managers, such as CalPERS, the retirement system in California, were just doing what their investment textbooks said they should do. They were following recent asset allocation research that suggested holding a broad basket of commodities futures could help immunize them from the ravages of high inflation and reduce the overall riskiness of their investment portfolio. Economists disagree on the impact of these new commodities investors. Since they don't consume the commodities they invest in, many economists think their impact is limited. Economics blogger and Professor James Hamilton did a pretty extensive analysis on the topic. His conclusion was that speculators along with these new commodities investors may increase price volatility, but their impact is mostly temporary and wasn't the primary driver of the commodities bubble. Many economists believe that the commodities bubble was a natural result of strong worldwide economic growth through early 2008. They believe increased demand from several emerging economies, such as China and India, strained the supply of all commodities and that's why the prices of seemingly unrelated commodities increased together. Regardless of whether the impact on prices of commodities by pension fund investors was transient or more sustained, most agree that the inflow of institutional money from sources such as CalPERS has been a big factor in the volatility of commodity markets over the last few years. There's little doubt that this added volatility has at least played a role in the pain felt by dairy farmers in places like Stratham, NH. Last month, several news outlets, including the Union Leader, WMUR, Seacoast Online and others reported about a few cases of local police departments using twitter as a way to keep folks updated on local happenings. I read the story with interest because it seemed like a good application for twitter. Well, it's been about a month since those stories broke, so I thought I'd post a quick follow up. First I have to confess a bias - IMO, twitter has become way over-hyped. Lots of people are creating twitter feeds in cases where the technology is clearly not a good match. Let's face it, using twitter involves tradeoffs. Not all of us can condense our thoughts down to just 140 characters. Twitter is really a niche application that does a great job with a certain type of communication - Real-time point-to-multipoint and multipoint-to-multipoint messaging where access to a web browser is limited. That's it. If your message doesn't need to be read by its intended targets within an hour or two, and if the senders and the receivers of messages are likely to have ready access to an Internet connected computer, twitter probably isn't the right technology for the job. That said, local police departments' use of twitter seemed like a good match for the technology. Both the senders of the messages, as well as the receivers might not have computer access and time is certainly of the essence. Last month, I signed up to the RSS feed for the EppingNHPolice twitter account. Receiving tweets through RSS in a news reader is pretty handy. Part of twitter's power is that it can be accessed by whatever means is most convenient. Just because you can use your cell phone doesn't mean you have to. Since my online world is centered around Google Reader, that's how I subscribed to the EppingNHPolice feed. After a month of following the EppingNHPolice twitter feed, IMO, they've really hit a home run. I don't know anything about how they're structured, or who the driving force is behind the tweets, but if you follow the feed for any length of time, you can't help but notice that they're using the technology to the fullest. Below, I've posted a summary of the tweets from the last day or two. Over the last month they seem to average 5-10 tweets a day. That seems to me like a reasonable number considering everything. Disclaimer - I'm not a resident of either Greenland or Epping, although I do drive through both towns from time to time. Watts up with these CFL bulbs? The other day, I was doing a check of our power outage gear and I encountered a problem with the power draw of some compact fluorescent light bulbs. In the photo above, you might be able to read that it's a 20 watt bulb. Even though the bulb is only a 20 watt bulb, because of some weirdness in how CFL bulbs work, the draw of the bulb can be considerably more than 20 watts (more later). Don't get me wrong, CFL bulbs are great. I have a zillion CFL bulbs installed all over the house, including some nifty recessed ones in our kitchen (see above). We have 8 recessed lights in the kitchen and they used to have 85 watt incandescent bulbs. When I switched over to CFLs, we went from 680 watts to only around 160 watts and we get roughly the same light. Since this light is on for 6-8 hours a day, the savings are substantial. You just can't beat the efficiency of CFL bulbs. But back to my issue - well sort of. First a detour. While I was away from home in the winter of 2006, DW had to deal with a nasty 3-day power outage. If it weren't for her ingenuity and persistence, we would have certainly had frozen pipes. Following this near disaster, I purchased and installed a 5,500 watt generator. It gives us water, heat, light, and a few other essentials whenever the power goes out. 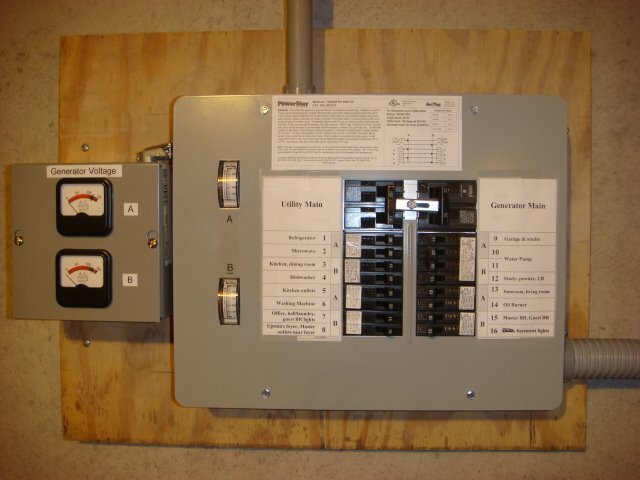 I talked to my electrician and did some research on connecting the generator and found that most transfer switches (that allow you to plug a generator into your home wiring) are limited to just 6 or 8 circuits. The way modern homes are wired, the actual draw from each circuit is pretty small and 5,500 watts can run a lot more than 6 circuits if you're careful about how you do it. I decided on this GenTran 50 amp transfer switch. This is way oversized for our generator, but it gives us lots of options. At first, I thought I'd need to be picky about which circuits I lit up when on generator power, but after some experience, I learned that as long as you pay attention to the big stuff (toasters, coffee makers, hair dryers, microwaves, etc), everything else is just noise and runs fine. Of course, I make sure I switch on the circuits one at a time to ease the startup load on the generator. Also, I installed voltage meters to go with the amp meters so I can watch the load levels. This setup worked great during the December 2008 ice storm outage. As great as it was to have, I was hesitant to run the generator non-stop. It's loud and it seems wasteful to have it on all the time. For us, running it in the morning for a couple of hours, and then again in the early evening for dinner seemed to be a good balance. Also, when the power goes out for a short time, it doesn't make sense to haul out the generator and fill it with gas just for a 2-3 hour outage (which most tend to be). So to help with the time when the power is out and the generator is off, I picked up this Xantrex portable power pack (basically a battery and an inverter) to give us some light and a little power. It works great and even though it was pricey (I got it on sale for around $120), it fills an important role. It's great for camping and other remote power needs and I actually use it a lot more than the generator. Since the power pack above takes 35 hours to recharge with the AC charger, I also wanted a smart battery charger that could do quick charging during my limited generator runs. This 25/10/2 amp Black & Decker unit is currently on sale at the B&D outlet in Kittery for $27 and fits the bill nicely. It's a smart charger that automatically adjusts its output to the battery, so it can really pour in the juice in a hurry. With the 35 28 Ah Xantrex unit, it gets the job done in 2-3 hours instead of 35 (This isn't great for battery life, but it's workable in a pinch - I use the slow charger whenever I have time). Also, while I was at the Black & Decker store, I picked up an additional power pack (this one has a 19 Ah battery, with DC only output) for $41 on sale. I couldn't let such a great deal go, and I have a small dc/ac inverter that I can use with it. This setup can give me some additional runtime, or power a couple laptops or a small tv. It also can be used to jumpstart a car or inflate tires. Anyhow, back to my CFL problem and the power outage test-run I was doing. I wanted to be able to really light up a room with the non-generator power backup system. Not just with a faint candle glow, but with bright light. The Xantrex power pack, with its 28 Ah battery (~330 watts for 1 hour), should have no problem doing that, even for several hours, as long as I use efficient CFL lighting. So I dusted off an old 3-socket lamp from the basement and inserted 20 watt CFL bulbs (see first photo) in each of the sockets. I expected no problems with this setup, since the power pack can sustain 480 watts of draw and the 3 bulbs added up to only 60 watts. Unfortunately, I was wrong. When I hit the switch I was greeted with a sustained flicker from all three bulbs. Confused and perplexed, I did what any guy would do. I tried it again, and this time it worked. Then I let it rest and tried it again, and got flicker. Finally, I unscrewed one of the bulbs and tried yet again and it lit fine. Next, I screwed the third bulb back into its socket. It also lit up fine and now the room was as bright as day. For fun, I hooked up a 100 watt fan (because I could), and sure enough, it ran fine along with the lights. Hmmm, I thought. That doesn't make sense. I tore everything down, let everything rest a bit and repeated my experiment. Sure enough, same result. What was going on I wondered? Why the intermittent results with the 3-bulb setup? I set out to track this thing down with some help from google. Within a few minutes, I learned about something called "Power Factor" and the issues that the low power factors of many CFL bulbs can cause. Power factor has to do with how a CFL bulbs sips juice from its 120 volt AC input. After reading a bunch of stuff, including this thread on an alternative energy site, I thought I had it figured out. But on reflection, it didn't quite make sense. The inverter I was using to generate the AC can provide almost 10 times the needs of the three bulbs. Even taking the power factor issue into account, along with other inefficiencies, the math said this should work. 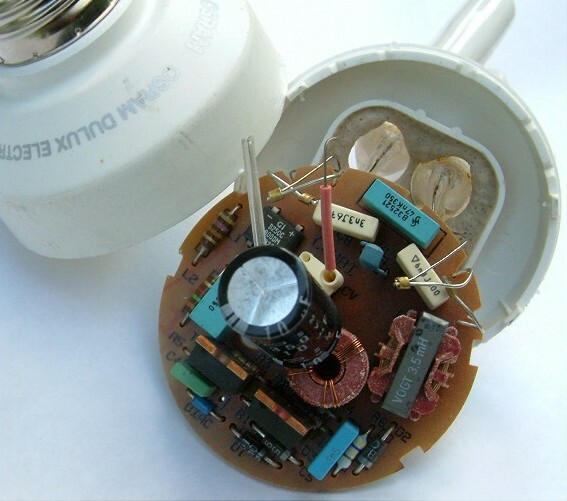 Then I found an even more technical post about CFL bulbs and power factor. This one gave me the clue I needed. The post is very technical, but it contains a key piece of info - How much instantaneous current does a 20 watt CFL draw? The answer sure surprised me, and it explained my problem. The scary looking waveform labeled "Tek Run" that's about mid-way down this page shows that a 20 watt CFL can draw as much as 200 watts of instantaneous current. Multiply that times 3 and I'm right at the limit of my system, and my guess is that this is the issue that I had. I knew that inductive loads like big motors can have a huge startup draw, but I never would have guessed that a CFL bulb could draw this much peak current, even if only for an instant. Apparently, the CFL draws a lot of juice for part of the time, but then nothing during the rest of the time. My guess is that this peak current is even higher at startup, especially when I look at the size of the capacitor (black cylinder) in the photo above. It may be that the inverter in my power pack isn't very robust and although it had enough juice, it just couldn't hold it together well enough to get all three bulbs going on the first try. Anyhow, it seems that when using smaller inverters and multiple CFLs, things may work better if they're not all turned on at once. Incidentally, once I got the bulbs on, I left them on for over three hours before the inverter cut out due to a low battery. That was an hour or two less than theoretical max, but considering the draw of the inverter itself, as well as other inefficiencies, and the fact that the battery is a couple of years old, it seemed about right. Last week, I posted a graphic from the US Dept of Energy that shows how some of the best sites in the country for wind power potential are located in the midwest. Well, it turns out that harnessing that power in the midwest and building transmission infrastructure to ship it up to the Northeast is not something that the northeast is eager to have done. An influential coalition of East Coast governors and power companies fears that building wind and solar sites in the Midwest would cause their region to miss out on jobs and other economic benefits. The coalition is therefore trying to block a mandate for transcontinental lines. They want the wind farms built in rural New England and offshore from Massachusetts to Delaware, and for now it appears that they may get a chance to do that. They are campaigning to keep a provision out of the legislation that would mandate a huge super-high-voltage grid, with the cost spread among millions of electric customers. The article sure shows how tricky it can be to balance the need for cheap & clean energy with regional needs for local jobs and control of local resources. A few years back, California learned the hard way that placing control of your energy destiny in far away hands can be a really bad thing. It looks like folks in the Northeast are hoping to avoid that mistake. Out of curiosity, I wondered if NH was part of the effort, and sure enough, it looks like we are. And a weak grid helps some electric companies. Local generators have often been able to charge more by being in the right place at the right time, with no competition because the long-distance lines are already fully loaded, experts say. “When you have a constrained transmission system and you seek to unconstrain it,” said Mary Ellen Paravalos, the vice president for transmission at National Grid, a New York and New England company, some local parties stand to lose. This is true “even if the wider societal benefit is net positive,” Ms. Paravalos said. The Memorial Bridge in Portsmouth, NH has been in the news recently due to concerns about its safety and because of the high cost of some long overdue repairs. The plan for its refurbishment was all set to go, but bids came in $15 million higher than expected. That turned out to be a 35% cost increase, and it put the project on hold. Well, it turns out that the bridge has a history of construction bids coming in higher than expected. While I was googling around for information about industry along the Piscataqua, I stumbled on an interesting article about the Memorial Bridge's construction in a book by the American Society of Civil Engineers that dates back to 1922. Thanks to the magic of Google Books and expiring copyrights, I was able to find and read this interesting little bit of history. On September 14th, 1920, proposals were asked for the construction of the foundations and superstructure, in two separate bids. The two bids exceeded the amount available, $1,500,000, and the contracts were not awarded. The original plans called for piers about 100 ft. long, with large sloping ice-breakers on the up-stream end, with a double Strauss lift bridge of 300 ft span. As the authorities were anxious to complete the bridge, further studies were made to reduce the cost. A Waddell lift span was substituted for the Strauss lift, and the piers were re-designed and made symmetrical by omitting the ice-breaker. The result of these studies was that contracts were let, the substructure being awarded to the Holbrook, Cabot and Rollins Corporation, and the superstructure to the American Bridge Company. The work was awarded in November, 1920, and the speaker's firm began immediately to get plant and material on the site. I'm no structural engineer, so I had to do some more googling to learn what a double Strauss lift bridge and a Waddell Lift span were. My task was slightly complicated because the double Strauss lift is a type of Bascule bridge and the Waddell lift is a type of vertical lift bridge. BTW, you've got to check out those links if for no other reason than to see the cool animated gifs that show the bridges in action. I'd sure be lost without Google and Wikipedia! Anyhow, the book I mentioned is embedded below in Google's book reader. If you click on "more about this book" on the bottom right of the reader, you can read and even download the entire book (all 1900 pages) for free if you like. The article is titled "Difficult Foundation Problems for Piscataqua Bridge at Portsmouth, NH" and that's the real story of the article. It goes into great detail about the engineering difficulty of setting the piers for the bridge in the fast-moving Piscataqua River. The Piscataqua has some of the fastest currents of any river in North America and the challenges forced construction crews to build the two piers in fits and starts, improvising as they went along. After setting the foundation for the northern pier basically where they wanted, the crews were unable to find the expected bedrock in the river bottom to set the southern pier as planned. Instead the foundation for the pier was set 12-19 feet below the river bottom in hardpan, which was determined to be good enough. Despite the challenges and trips back to the drawing board, they did still manage to complete the bridge on time in 1922. I suppose the fact that it's survived so well for over 95 years is a testament to their good workmanship and their ability to make good tradeoffs. Below is a You tube video with some rough footage of the construction from the 1920s. 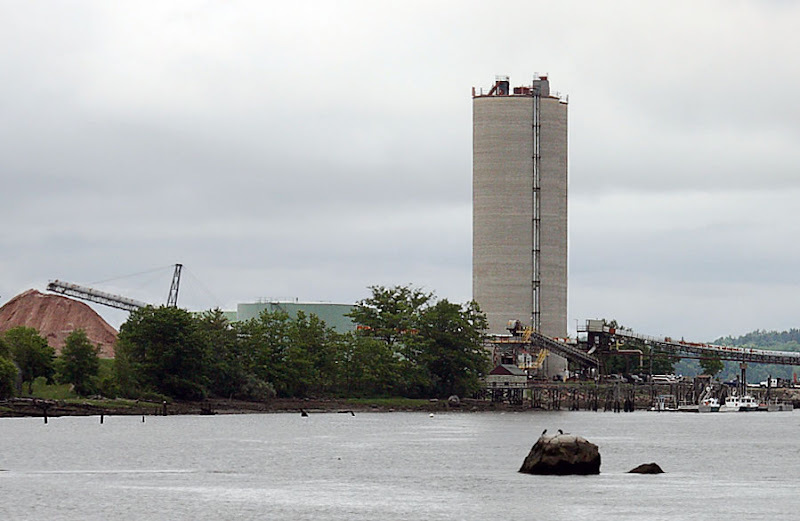 The two tall concrete towers to the right in the photo above are recognizable landmarks to many in the NH Seacoast. Perhaps you've noticed them while driving on the Spaulding Turnpike, kayaking on Great Bay, or hanging out at Wagon Hill Farm. From a distance, they look like smoke stacks for a power plant. It turns out, they're actually storage silos for Portland cement. 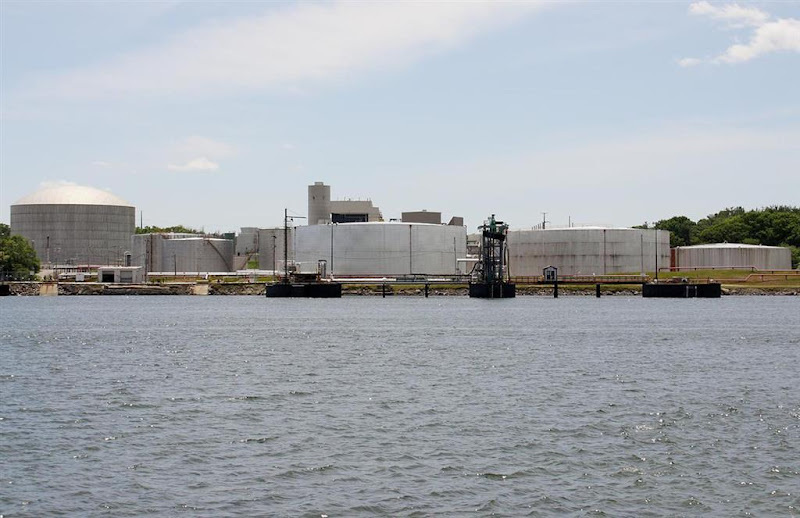 Sprague Energy operates two marine terminals along the Piscataqua River in Newington, NH and another storage and distribution facility in Portsmouth. The Google Map below shows the locations of the three facilities. 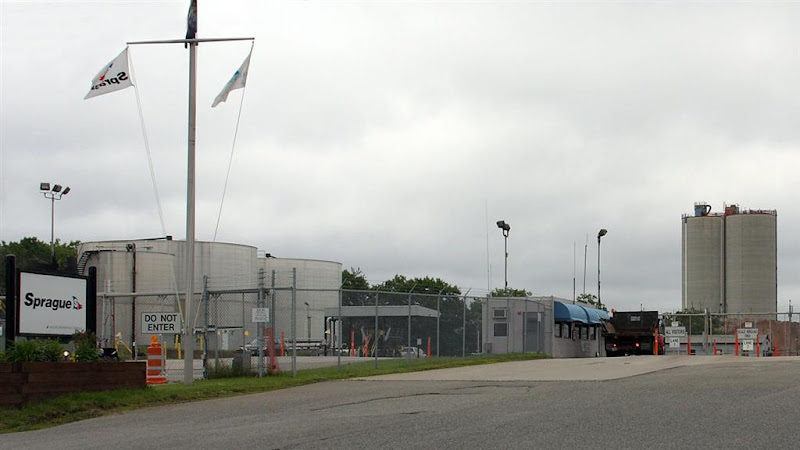 The northern most facility is referred to as the River Road facility, while the middle one is called the Avery Lane facility, and the southern most facility is called the Portsmouth or Gosling Road facility. You can see the clusters of storage tanks from the three facilities in the Google Map above. The three facilities are as industrial-looking as anything on the Seacoast and some may think they're downright ugly. But the truth is, these Sprague Energy facilities are an essential part of our local infrastructure. Whenever you adjust your thermostat in the winter, light a burner on your propane stove, drive on a local road or over a local bridge, you may be using a product that passed through one of these facilities. All of these storage tanks are connected to the marine terminal by pipelines so they can be filled from incoming tankers. The storage tanks are also connected by pipeline to truck loading racks for distribution throughout the Seacoast and beyond. The River Road site also has open storage for 165,000 tons of salt and 120,000 tons of gypsum. You can see the piles in the lower part of the Google map or in this bird's eye view from bing maps. Tallow is the only export product stored at the facility. Tallow is rendered animal fat and is used in production of soap, cosmetics, bird seed, and biodiesel, among other things. Finally, the Gosling Road facility has three tanks that together can store 342,000 barrels of home heating oil. These tanks are connected by pipeline to the marine terminal at Schiller Station. Sprague Energy operates 20 marine terminals along the eastern seaboard and is headquartered at Pease International Tradeport in Portsmouth. The company had estimated revenues in 2007 of $136 million and employs around 500 workers. They are wholly owned by Axel Johnson Inc.
David Brooks, of GraniteGeek.org and the Nashua Telegraph, recently published a post on the Vinalhaven, ME, Fox Islands Wind project. His post got me digging into wind power a bit and I figured now was as good a time as any to do my first post on it. I did some quick calculations on the Fox Islands Wind project and I realized right away that this project was much more costly than most wind power projects. Wind projects usually cost around $2,000 per kilowatt to build, but the Fox Islands project is projected to cost over $3,200 per kW. Because of its remote location, the Fox Islands project is priced more like an offshore wind project than an onshore project. Offshore projects are more expensive because of the extra cost of transporting equipment and workers from the mainland and due to costs of erecting wind towers on the water. Normally, a wind project this expensive would be a tough sell, but because of Vinalhaven's remote location, residents pay a lot for electricity from the mainland. Most folks in New England pay around 13-15 cents per kilowatt hour for electricity. Vinalhaven residents pay 23 cents. That allows the Fox Islands Wind project to be competitive, despite its higher cost. It turns out that the midwestern states have the most onshore wind potential of anywhere in the US. Offshore, there are strips of great potential along the east and west coasts and in the great lakes region. Currently, Texas leads the nation in wind power generation, with nearly 8,000 MW of generation capacity installed. 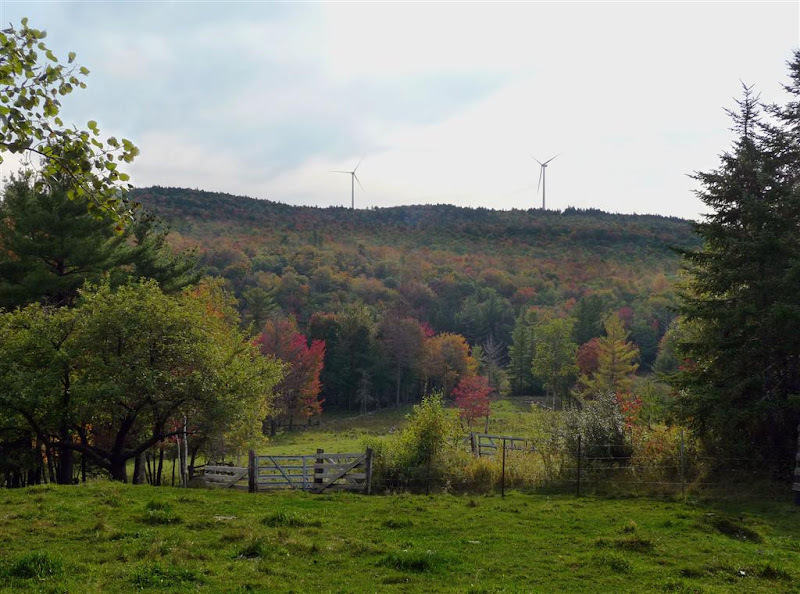 For its part, New Hampshire isn't particularly well suited for wind power overall. This is despite the fact that the highest wind speed ever recorded on the surface of the earth was measured at the top of Mount Washington. Although New Hampshire doesn't have vast amounts of onshore wind potential, we do have a few concentrations of high potential, particularly in the mountains. With only small pockets of high potential, the trick for New Hampshire and New England is to identify the sites that make the most sense to develop. To see how wind power developers go about doing this, we'll explore the finances of a few active projects. The best-practice approach for analyzing the finances of large capital projects, including wind power projects, is to use discounted cash flow (DCF) analysis. This methodology takes into account the fact that a dollar received in 1 year is worth more than a dollar received in 20 years. DCF models can be hand-built in MS Excel, but fortunately I found a great online tool called WindFinance that was created by the National Renewable Energy Laboratory (NREL). NREL is the U.S. Department of Energy's primary research lab for renewable energy and energy efficiency. The WindFinance tool is a very sophisticated financial modeling tool and it was relatively easy to use and understand. I used the tool to create models for a few local wind projects. Since I don't have detailed cost information for these projects, I used estimates from publicly available sources and historical cost data from NREL. Because some of these inputs are just guesses, the tool's outputs are probably not very precise. That's ok, since the real goal of the exercise is to show the basic economics of wind power and show some of the factors that can impact the cost of energy for a project. The projects I chose to evaluate are the Lempster Wind project, in Lempster, NH which began operation in 2008, the Coos County Wind project, which is still in the planning phase, and the Fox Islands Wind project, in Vinalhaven, ME, which was mentioned in David Brooks' post. The table above shows the values I used as inputs in the analysis. These inputs should be pretty self explanatory, especially if you've read my earlier post about electricity generation economics. Installed cost per kW and annual production in MWh are actually computed from the other inputs. The installed cost per kWh for the Coos County project is on the high side compared to Lempster, and compared to national averages. This is probably because the turbines will be installed along mountain ridges at high elevation. Coos is priced about halfway between the average cost of onshore and offshore wind projects. The "Operating cost per kW installed" input was basically a guess. This input is the total annual cost for fixed and variable expenses associated with running the wind farm. It includes things like maintenance on the turbines, property taxes, insurance, and any other operating overhead. For simplicity, I combined all these costs and modeled them as an expense based on kilowatts of installed capacity. Also, I used a life expectancy of 20 years for all scenarios. The last column of the table above shows the WindFinance tool's estimate for the levelized cost of energy for each scenario that I modeled. The LCOE output represents the minimum wholesale price that a power generator can receive for their output and still cover all their expenses. I ran a few scenarios with variations in cost of capital, tax benefits, and renewable tax credits, in order to show how changes in these inputs can impact the cost of energy. The dollars per MWh and cents per kWh estimates in the table above represent levelized wholesale energy costs. To put these costs into perspective, exhibit G-13 of PSNH's LCIRP, estimated 2009 energy prices at between $47 and $63 per MWh for off peak power and between $64 and $85 per MWh for on peak. For the baseline cases above, I assumed a $21 per MWh renewable energy production tax credit (PTC) for 10 years. Recent federal legislation allows developers to choose between the production tax credit or an investment tax credit of 30% of the capital cost of the project. Incidentally, the subsidies for wind are much greater in Europe. In Germany for example, the credit is currently set at $90 per MWh for the first 5 years, then $50 per MWh thereafter. Also in the table above, you can see how sensitive the final energy cost is to changes in cost of capital, tax handling, and tax credits. For the Fox Islands project, I modeled the project structured as a corporate for-profit project, probably using equity financing, and as a community or utility project, perhaps financed mostly with debt. For the first case, I used a 13% cost of capital with a 40% tax rate and for the second I used an 8% cost of capital and a 0% tax rate. This simple example really shows how the structure for the project, eg independent power producer vs. utility, vs. community project can really impact the economics. With this analysis, you can see that wind power isn't the panacea of plentiful, dirt-cheap electricity that some make it out to be. OTOH, when the costs of power plant emissions and our fossil fuel dependence are brought into the equation, wind power has proven itself to be a viable part of the solution. In addition, technological advances continue to improve wind power economics and the pace of innovation shows no signs of slowing. My analysis didn't take transmission costs, capacity payments, or firming costs into account. Firming costs are often assessed on wind generators because their output can be unsteady and may have negative impacts on the power grid. All three of these factors can have an impact on the final delivered cost of energy from wind power. To wrap up, below is one last table that shows basic cost and estimated production information for some active wind projects in New Hampshire and Maine. Maine currently has the most wind power generation in New England and has been actively encouraging wind power projects. The state recently passed legislation to fast-track permitting for wind projects located inside certain remote areas of the state that officials felt are well-suited for utility-scale wind projects. New Hampshire is a net exporter of electricity, with over 50% of its electricity production consumed in other New England states. However, because the overall supply of electricity in New England is tight, and because electricity has no trouble crossing state boundaries, New Hampshire's electricity rates are heavily influenced by supply and demand factors all across New England. In addition, new state and federal regulations on power plant emissions and renewable energy generation are heavily influencing the economics of power generation in New Hampshire. As a result of all this, NH has several new electricity generation projects in the works. Most of these new projects involve renewable energy such as wind and biomass and their success could help assure that New Hampshire has the electricity it needs to keep our homes comfortable and our industries vibrant. In each of these new projects, planners, developers, and regulators must correctly estimate and manage several economic variables that will make the difference between success and failure. Below I'll try to dig into the details of some of these factors. First, a caveat on this analysis and the charts and graphs I've made. I have a background in finance, but I'm not from the power industry and everything I know about electricity I learned from Google :) If you see something that doesn't make sense or doesn't look right, please use the comments to let me know. Different electricity generation approaches have different tradeoffs, as can be seen in the graph below. The cost to build a new power plant, in $ per kW of capacity, is plotted on the y-axis, while the cost to operate the plant (including fixed, variable, and fuel costs) is plotted along the x-axis. You can get a good idea of the basic economic tradeoffs by comparing the positions of nuclear and natural gas. 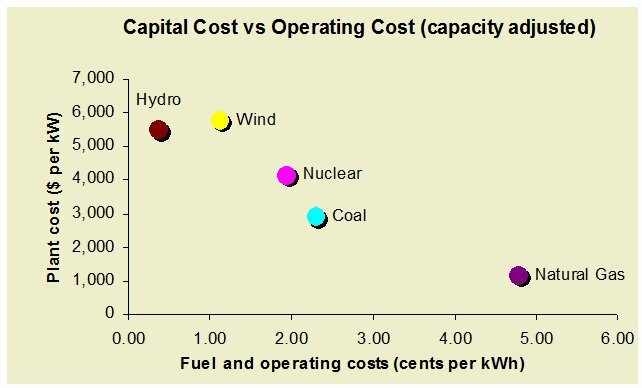 Nuclear power plants cost a lot to build, but because their fuel is inexpensive, they cost relatively less to operate. Natural gas plants are less expensive to build, but they burn more expensive fuel to generate power. Other power plant operating costs can also be a big deal, especially in New Hampshire where property tax rates are high and variable. 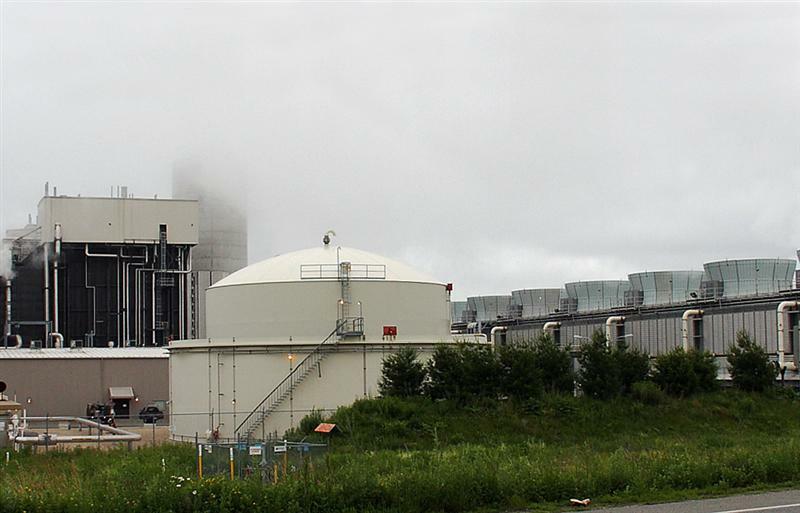 For example, the Newington Energy natural gas plant that's pictured above is assessed at $256 million dollars and its owners pay around $2 million in annual property taxes. In Londonderry, the Granite Ridge facility is assessed at $235 million, but its owners pay over $4 million in annual property taxes. In both cases, property taxes will have a significant impact on the cost of the energy that these plants produce. Although the graph above gives an idea of the economics of various generation approaches, it doesn't tell the whole story. When modeling the economics of a new generation source, planners consider something called the "capacity factor." This input helps them adjust for the fact that different power generation approaches can have vastly different productivity over the course of a year. For example, the Seabrook Nuclear plant probably has a capacity factor of 85-90% and the Merrimack Station coal plant probably runs at 75-85%. These base load plants operate 24/7, with only a few days of down time a year. Conversely, the new Lempster Wind facility probably operates with a capacity factor of 37% or so. Wind and hydro power plants can only produce power when the wind blows or the water flows, so they generally have much lower capacity factors than fossil fuel or nuclear plants. When you adjust the cost of building a new plant by its expected capacity factor, you get a very different graph, as seen below. 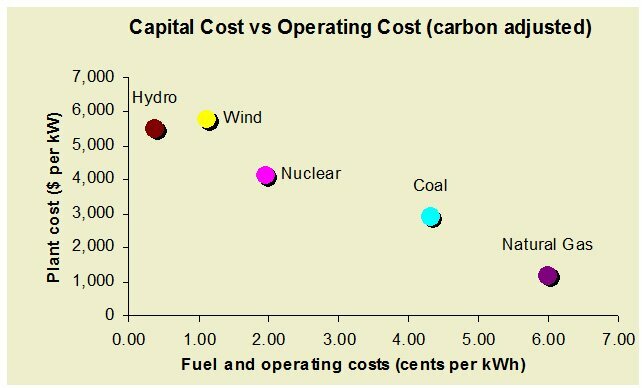 Notice that nuclear and coal look much less expensive, while hydro and wind look more expensive. Next, it's only fair to adjust the graph above to compensate for the costs of the emissions released by the various generation technologies. I touched on the costs of emissions last week when I posted about the recently proposed cap-and-trade energy bill. For the chart below, I priced carbon emissions at $20 per ton of instead of the $28 that I discussed in the cap-and-trade post. The true cost of power plant emissions is a hotly debated subject, but $20 is certainly enough to drive home how much emissions costs can impact the economics of power generation. You'll notice that both coal and natural gas become more expensive when emissions costs are added in, while hydro, wind, and nuclear remain unchanged. I made one more graph to show how the vagaries of the market can toss a monkey wrench into the best laid plans of power plant developers. Recently, the relative costs of coal and natural gas have moved in opposite directions and if the new relationship persists, it will have a big impact on the economics of power generation. The cost of natural gas went from $6.53 per million Btus (mmBtu) last year to as low as $4.30 recently. Meanwhile, the delivered cost of coal has increased from under $2.00 to over $2.50. Most economists expect the costs to reset back to their historical relationship, but the graph below shows what the economics looks like if they don't. You can see that with these prices, it finally looks like a good time to own a natural gas power plant! We've touched on the basic economic considerations of electricity generation, but I've left out a few other important factors. The main ones are the power plant's cost of capital, the tax treatment and tax benefits of a project, and finally, the impacts of capacity payments and renewable energy credits on the project. 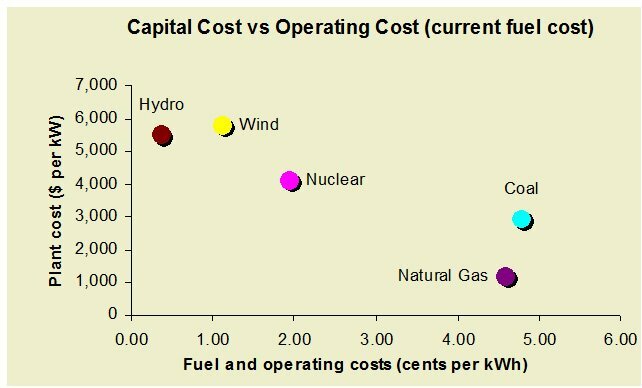 Power generation facilities can be very costly to build and in the case of nuclear, wind, and hydro, financing costs represent a huge part of the total cost of a plant's energy. Using these high-capital/low-fuel-cost approaches is like prepaying for 20 years worth of electricity up front. This is where "cost of capital" comes into play. Cost of capital is the cost to a power plant developer to finance the project over its lifetime. It's a crucial factor in determining the overall cost of power from a new plant. Small changes in a project's cost of capital can easily impact the cost of a plant's output by 25% or more. When you or I apply for a car loan or a mortgage, the rate we pay for the loan depends on our credit rating and on how risky the bank considers the loan. The same is true for power plant financing. The cost to finance the project depends on who's doing the project and on how risky the capital markets think the project is. Factors such as the technology used, the likelihood of cost overruns or delays, whether the project is financed with debt or equity, and general market conditions will all affect a project's cost of capital. Currently, because of their large capital requirements and risk, nuclear power projects are all but shut out of the capital markets in the US. Conversely, renewable energy projects, with all the regulatory and public attention they are getting lately, are enjoying reasonably good access to capital markets. The tax treatment of a project's capital costs can also have a significant impact on the cost of the energy that a plant produces. The quicker a plant owner can write-off their capital outlays, the more economical the plant will usually be. 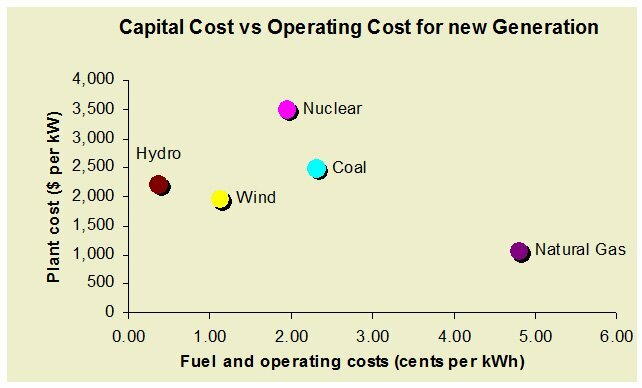 Capital costs for most power plants are depreciated over a 15 year period, however wind, solar, and some other renewable energy sources are allowed to depreciate their capital outlays over 7 years. Faster depreciation lets plant owners offset profits from other projects and pay less taxes, which boosts their overall profits and cash flow. Electricity generators in deregulated electricity markets may receive payments called "Capacity Payments" from a capacity auction process or from sales of their capacity to utilities . Capacity trading systems are designed to encourage the construction of new generation capacity and to assure a reliable power grid. In their 2007 Least Cost Integrated Resource Plan (fig G-14), PSNH estimated capacity costs to be in the range of $3,000-4000 per month per megawatt of generation capacity. This payment is based on the unforced or available capacity that a generator promises to bring to market. 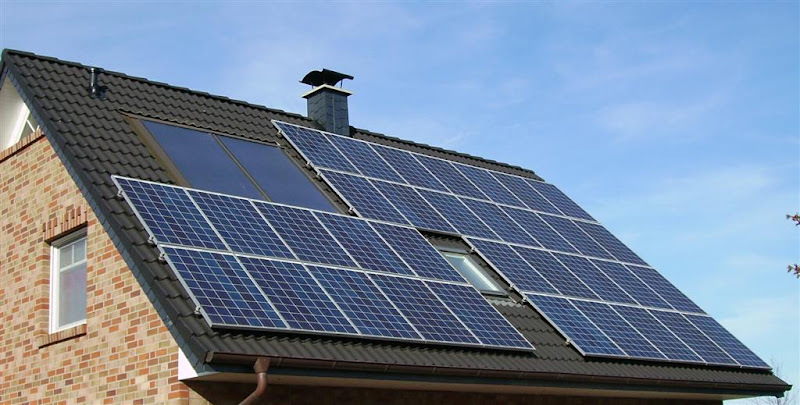 There are several state and federal regulations that provide tax credits for renewable power generation. There are also regulations that provide for penalty payments if a utility doesn't get enough of their power from renewable sources. These incentives, which can be as high as $30 per MWh of energy produced, can allow otherwise marginal renewable projects to become economically feasible. The idea is that the subsidies will cause these new energy sources to be developed more quickly, which will reduce our dependence on foreign energy sources and benefit the environment. I've presented the basic economics underpinning electricity generation and have hopefully at least touched on the major factors. What I've learned is that you can't just look at fuel cost or the construction costs when considering the economics of a generation source. The ethree.com report that I linked to above pulls all these cost factors together pretty nicely. They list something called the "Busbar Levelized Cost of Energy" for each generation source (in $/MWh), and then add in some other interconnection and transmission costs to come up with a final estimate. Although this analysis was done for California, and it modeled generation sources coming online in 2020, the results are still interesting. Their final cost estimates are shown in the last column of table 4b and are given as ranges that vary widely. For me, working through the details of this report, then noticing the wide ranges in their final estimates, really drove home the difficulty in predicting future energy costs in the face of so many complex and uncertain factors. A few weeks ago I did a post about the progress at the new shopping center that's under construction in Greenland, NH. I thought I'd do a quick update on the progress on the new Target and Lowe's stores, and get some new photos. As you can see from these new photos, Target certainly looks ready to go. Although before you head on over to Greenland, you should know that the grand opening for Target isn't until July 26th. Even though the store isn't open yet, the parking lot was bustling when I shot these photos. Presumably, these cars belong to the new employees who are stocking the shelves and getting ready for the grand opening. Even the shopping carts and cash registers look ready to go! Progress on the Lowe's building to the left of the new Target, is not quite as far along. The shell of the building is more defined than it was in my previous post, but the construction crew on this job has lots to do before Lowe's will be doing any grand openings. I think they're still on track for a fall/winter opening at Lowe's. (UPDATE: according to SeacoastOnline, the opening is scheduled for Jan 8, 2010). Despite all this activity on the site, there's still no sign of a Stop and Shop building. There is an unpaved empty gravel area to the right of Target, that I presume will be the Stop and Shop building, but so far there's no sign of any construction there. Let's hope they're not a victim of the tough economy.